Ben een geweldig mooi en inspirerend boek aan het lezen: “Healing mantra’s, Using Sound Affirmations for Personal Power, Creativity, and Healing” van Thomas Ashley-farrand. Er is ook een cd bij verkrijgbaar, die helaas uit 1 lange track van ruim een uur bestaat. Op bol.com staat dat je de cd erbij krijgt, maar dat is niet helemaal duidelijk. Mantras, or simple chants, are short phrases packed with energy and intention, specifically designed to generate powerful sound-waves that promote healing, insight, creativity and spiritual growth. The transformative power of sound has been passed down to the present day from the sages of India, the scientists of ancient Greece and medieval monks. 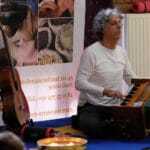 Mantras and chants have inspired, comforted and mended the lives of cultures, religious orders and individuals. This is the first book to explain and adapt ancient Sanskrit mantras to Western needs. In ‘Healing Mantras’ the author shows how and why mantras work, and how to use them for everything from curing specific ailments to finding inner peace. In each of more than fifty mantras, all translated from the Sanskrit, Ashley-Farrand unlocks the power of every word, explains its appropriate application and tells you how to pronounce it in easy-to-follow, phonetic symbols. The mantras can be repeated aloud or silently by everyone anywhere, to help and to heal. 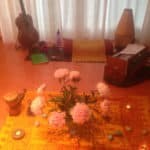 Beginners will find here a lucid and solid grounding in sound meditation, but even those who already practise some energy-based techniques will discover much to enrich their spiritual journey to healing and freedom. * The book includes a free CD to help you on your way.